Honda S660 Concept - Honda to bring a small car with a Honda S660 sports car concept as the Honda S2000, but with a smaller display. The car design is inspired from electric car Honda EV-STER concept. This car will be featured at the Tokyo Motor Show 2013, the end of this month. Honda has been had a compact roadsters like this before. S660 is the smallest car of the whole range of middle-engined sports car Honda. S660 seems to be the successor of the Honda Beat is also a Kei Car in Japan. Beat the time it was very popular as a roadster Kei Car toned along with Suzuki Capuccino. Honda S660 in the middle of 600 cc turbocharged engine with rear-wheel drive. S660 use the concept of electric three-cylinder engine 660 cubic inch small and provide power up to 64 horsepower, this engine will be coupled with a CVT automatic transmission "continuously variable". Honda confirmed that the Honda S660 and the like models to be launched in Japan during 2015. While likely to be present for the European market in 2016, but with the turbo engine is twice as powerful, 1.0-liter turbocharged engine Guaranteed powered 100 horsepower and the model roadsters and weighs about 850-900 pounds. It is intended to be able to compete with the Mazda MX5 and the Alfa Romeo Spider in the European market. 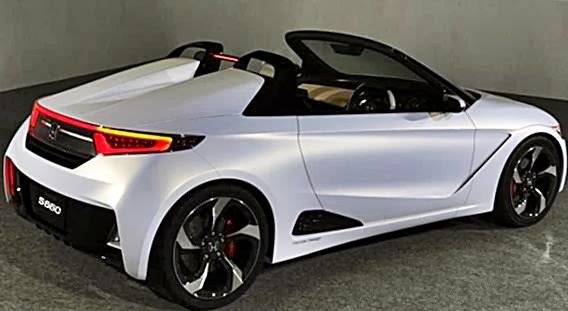 "Article : Honda S660 Concept - Mini Sport car Convertible"